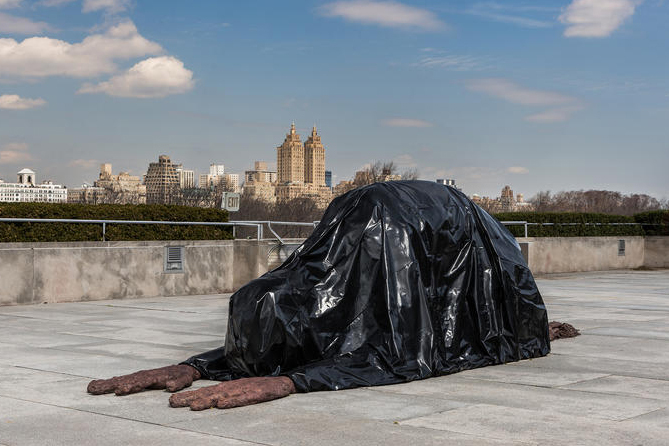 We Come in Peace, an evocative new installation by Huma Bhabha 85 PR, brings an otherworldly feel to the Metropolitan Museum’s roof garden. A new site-specific installation commissioned by the Metropolitan Museum of Art is creating a quiet stir high above Fifth Avenue in Manhattan. Called We Come in Peace, the pair of sculptures by Huma Bhabha 85 PR is activating the museum’s Iris and B. Gerald Cantor Roof Garden through October 28. The title of the new piece, which opened to a fanfare of media coverage on April 17, references the aliens’ promise in the 1951 sci-fi classic The Day the Earth Stood Still. But for Bhabha, a Pakistani-born artist whose work has long addressed themes of memory, place, war and displacement, that suspect phrase—“we come in peace”—also resonates with undertones of inequality, invasion, imperialism and other acts of transgression. For the commission, Bhabha approached the rooftop site as a sort of “landing pad” for two figures that have presumably “just touched down from outer space.” A five-headed, seemingly benevolent but very otherworldly being stands 12-feet tall, separated slightly from an 18-foot-long prostrate figure with oversized hands and a tail protruding from its shrouded core. Called Benaam, which means “without name” in Urdu, the latter figure is draped in a black shroud suggestive of a mix of a body (or garbage) bag or perhaps a burqa. 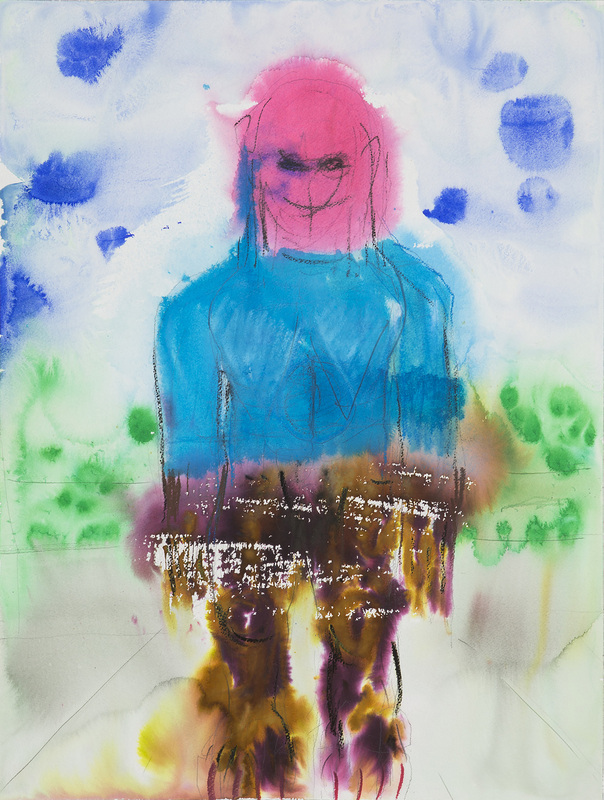 A form she originally created in 2002 and revisited in 2005 and 2006, the “abject pilgrim is both a prophet and a memento mori,” according to her gallery reps (at Salon 94). In a review in The New York Times, Martha Schwendener is one of many enthusiasts who applauds the project for being “shockingly, refreshingly, simple” and perfectly attuned to the site itself. The rooftop serves “as a kind of stage,” she writes, “an elegant play on the traditional pedestals on which sculptures were customarily displayed.” With their mythical presence and craggy surfaces, the sculptures also allude to historical artworks ranging from ancient Egyptian reliquary to the Gorgons and Medusas in Greek and Roman art to 19th- and 20th-century work by artists such as Auguste Rodin and Jean-Michel Basquiat. In short, We Come in Peace feels “like an extension of the complex conversation going on downstairs, inside a museum packed with 5,000 years of art history,” Schwendener writes. In conjunction with the Met installation, Salon 94 is hosting With a Trace, Bhabha’s fourth solo exhibition at the gallery, from April 22–June 1. The show features a sculpture, a suite of photo-drawings and a series of studies on paper that formed the genesis of her rooftop sculptures. Painter Rachel Grobstein MFA 13 PT creates miniature tableaus based on everyday objects, compelling viewers to consider the commonly overlooked. In a recent talk, visiting artist Vincent Valdez 00 IL illuminated the process behind his stark and unsettling images of American society.